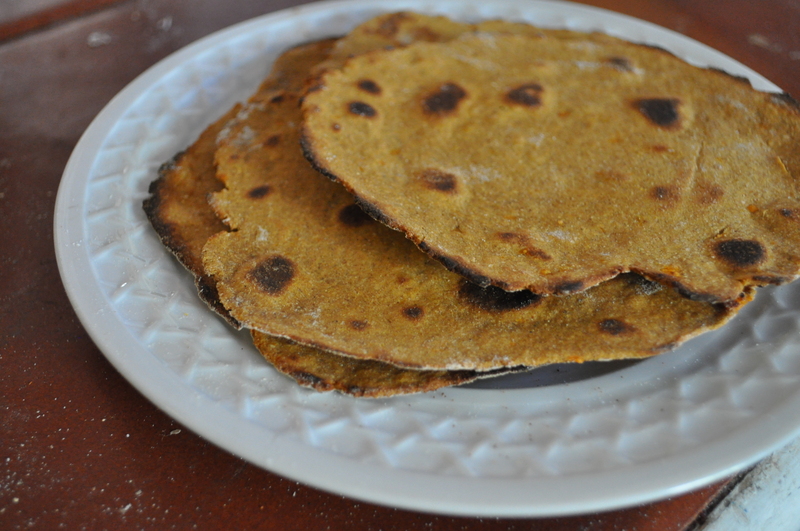 While making these banana chapatis recently I came across some sweet potato flour Mom had sent me. Obviously I started imagining how tasty these flatbreads might be with pureed sweet potato in place of the banana and some warm spices sprinkled into the dough. But any way you happen to mess these up, just slather on some honey, butter and cinnamon and you’ll be in sweet, blissful heaven. The whole wheat makes them hearty, and the sweet potato puree and flour gives them an earthy taste and slight sweetness without any added sugar. Keep the leftovers wrapped in the fridge and heat up for a light, comforting snack. Boil chunks of peeled sweet potato and mash or puree until smooth. Combine with wheat and sweet potato flours, spices and a pinch of salt to make a stiff dough. Add oil and water/milk as needed and knead well to form a smooth, medium-soft dough. After dough is smooth, cover and set aside for 10-15 minutes to rest. 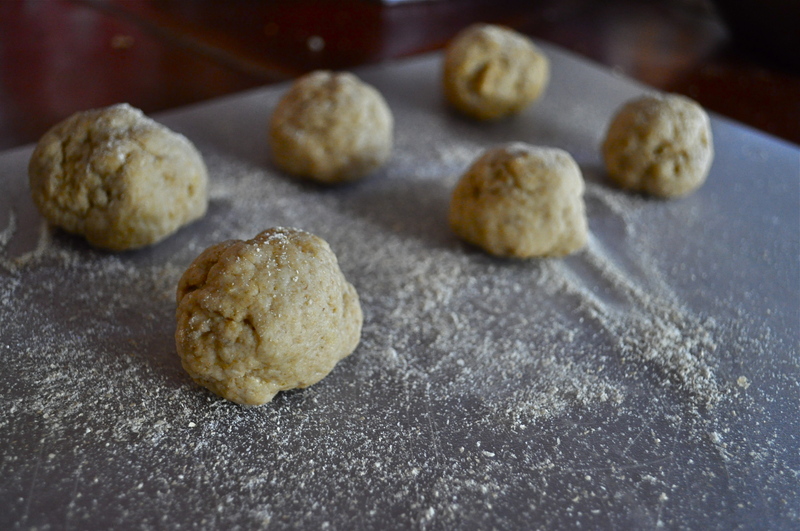 Divide dough into 1-1/2 inches pieces and roll each into a small ball. Either dust the balls with flour or sprinkle flour onto a flat surface to prevent sticking. 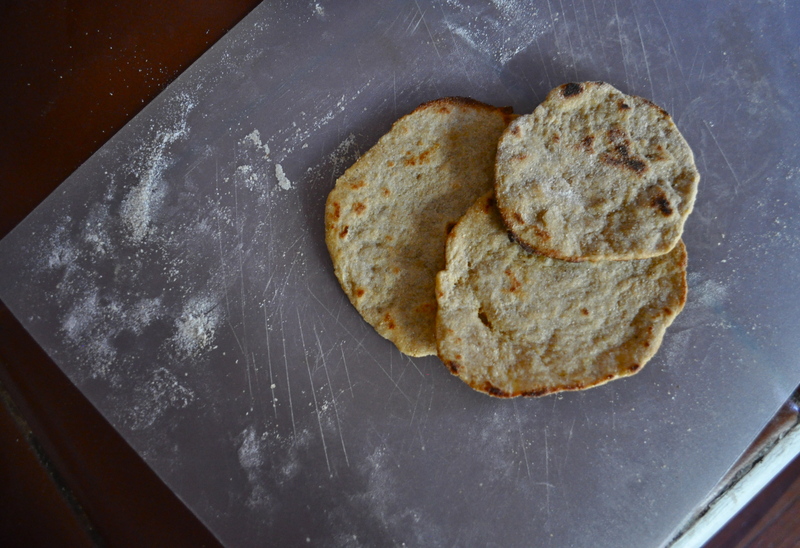 (Careful not to incorporate too much extra flour or chapatis will be tough). Roll each ball out with a rolling pin until it resembles a thin pancake (about 1/6” thick). Heat a griddle over medium-high heat. When hot lightly grease with oil and place a chapatti in the center. Turn it over with a spatula when small brown spots and small bubbles appear, about 1 minute. Continue cooking about 2 minutes until both sides have brown spots. Makes 8-9 chapatis. Check their website for events in your area, and go out and eat some REAL food! Also, here’s a link to a Food Day recipe book by some of America’s top chef and cookbook writers. Click the image to download the pdf. I’ve been eating this all week. Or maybe every meal of every day of this week would be more accurate. Any way these ingredients come together—whether as a raw salad, a veggie-egg scramble, or a warm sauté served on a bed of quinoa—they make for a comforting, filling, and most importantly, healthy meal. Let me explain to you how this goes: I chopped up a big bunch of kale with some onion, sweet peppers and carrots, and kept it in a bowl in the fridge. For breakfast I’d make an egg scramble with the veggies and beans, and top it with salsa. For lunch I’d have a big hearty kale salad with either more beans or shredded chicken, drenched in this lemon-tahini dressing. And for dinner I’d sauté the mixture in chicken broth with garlic, sliced apple and white beans, served on a bed of quinoa or brown rice and drizzled with more tahini sauce. A pretty versatile meal, huh? 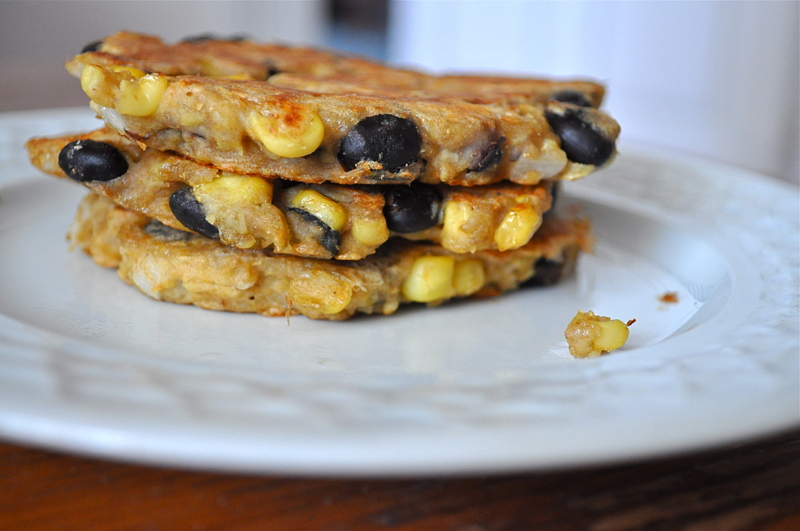 The combination of textures and flavors makes it deliciously satisfying, and the protein and fiber make it filling. And I don’t think anything makes me feel healthier than eating a big bowl of kale. It’s a win-win-win-win. 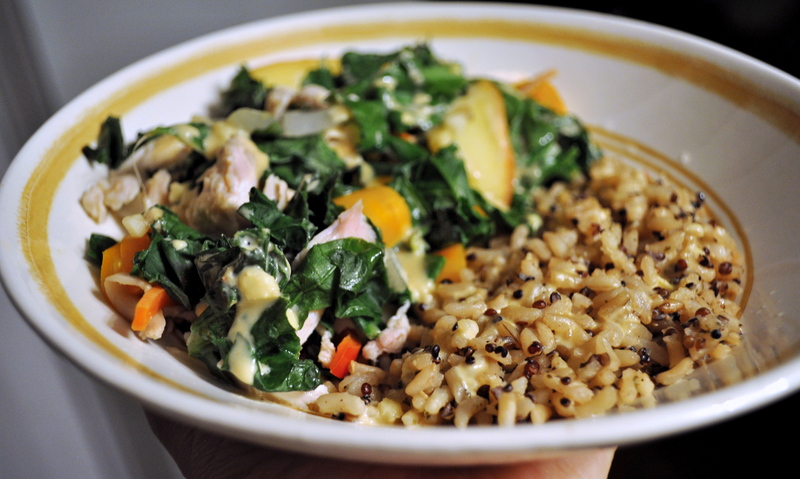 All this was inspired by a salad my sister Tara made this summer with kale from mom’s garden…. the very moment I fell in love with kale. I knew I had liked it cooked, in soups and such, but I’d never tried it raw! 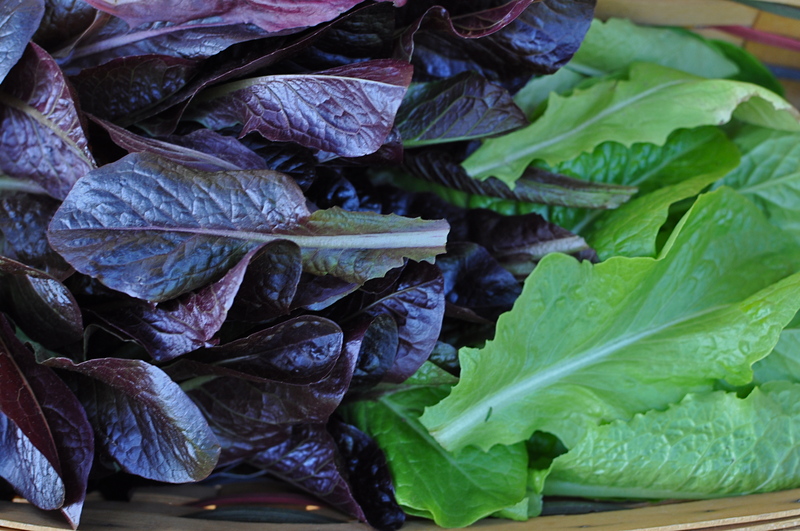 I imagined it being tough and more bitter or pungent than other greens—which is exactly what I love about it. No it wasn’t my typical spring mix salad, but it was earthy and hearty and filling. Tara’s salad was pretty basic if I remember: a mixture of chopped kale, peppers, white beans, maybe onions, olive oil and lemon juice and a crank of black peppercorns. So I found myself at the market with a big bunch of kale, remembering and wanting to recreate this delicious salad. 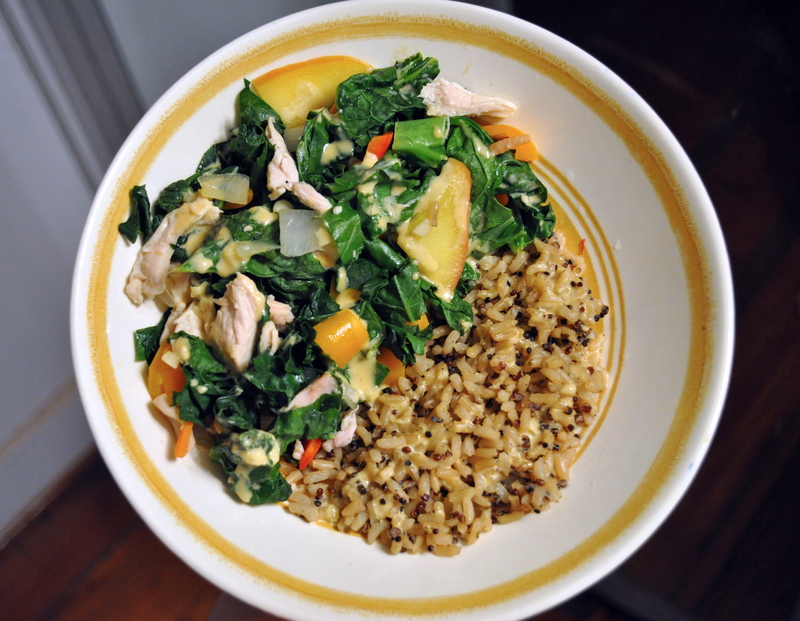 And then it got cold….. therefore this warm sauté was born, accompanied by a mixture of brown rice and quinoa and a lemon-tahini dressing I’d been wanting to try. So. Here I am today, just home from the market where I stocked up on more kale, and still enjoying every bite of this healthy, hearty meal in its various forms. That is the story of my week. Bananas find their way into my diet every day, although I can’t remember the last time I’ve actually peeled and eaten one. Such an abundant, cheap and versatile ingredient—they can be used to sweeten and lend subtle flavor to breads and smoothies, pureed to replace fats in baked goods, even grilled or roasted into caramelized sweet goodness. I actually get anxious when I wake up in the morning and walk into a banana-less kitchen. Whatever I’m going to eat that day, I know it’ll somehow involve nanas. Someday [soon] I’ll post a list of my infinite banana ideas and creations. I even have a pinboard on Pinterest dedicated to banana recipes, which I am rapidly working my way through. 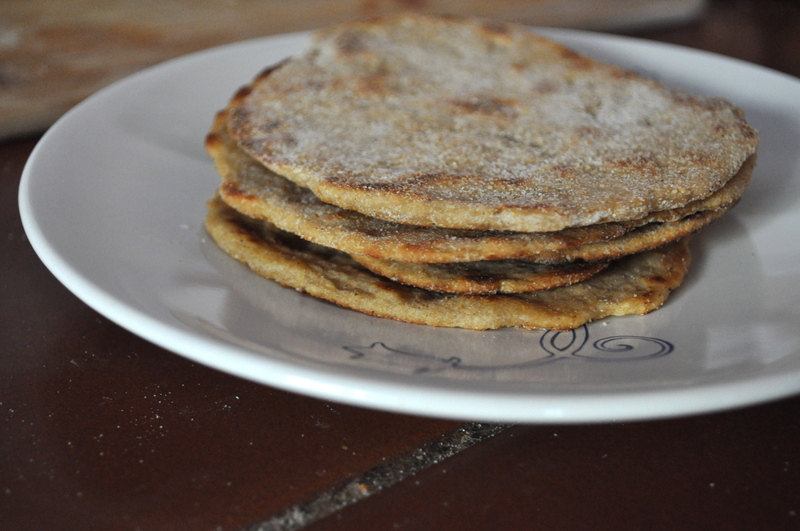 One of those pins had been catching my eye lately: sweet banana flat breads or chapatis. Chapatis are a type of Indian whole-grain flatbread cooked on a griddle– thinner than a pancake but thicker than a crepe, bubbly with big air pockets, and they typically accompany spicy Indian dishes. But with the subtle sweetness of mashed bananas I found these perfect for breakfast, spread lightly with butter and drizzled with honey and cinnamon. Mash banana well and combine with flour and a pinch of salt to make a stiff dough. Add oil and water/milk as needed and knead well to form a smooth, medium-soft dough. After dough is smooth, cover and set aside for 10-15 minutes to rest. Divide dough into 1-1/2 inches pieces and roll each into a small ball. Either dust the balls with flour or sprinkle flour onto a flat surface to prevent sticking. (I later read that you shouldn’t incorporate too much extra flour into the chapatis or they will be tough, which I think is what happened with mine). Roll each ball out with a rolling pin until it resembles a thin pancake (about 1/6” thick). 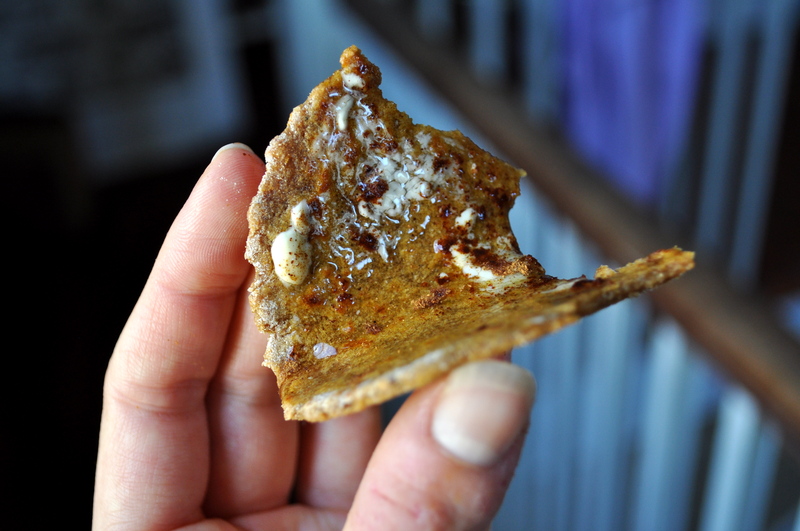 Enjoy your flatbread warm with some butter and honey or jam! Hello fall. let the pumpkin recipes begin! In celebration of the cooler weather and crisp blue skies that graced Charleston about a week ago, I jumped right into the seasonal-inspired baking. Preheat oven to 350F. 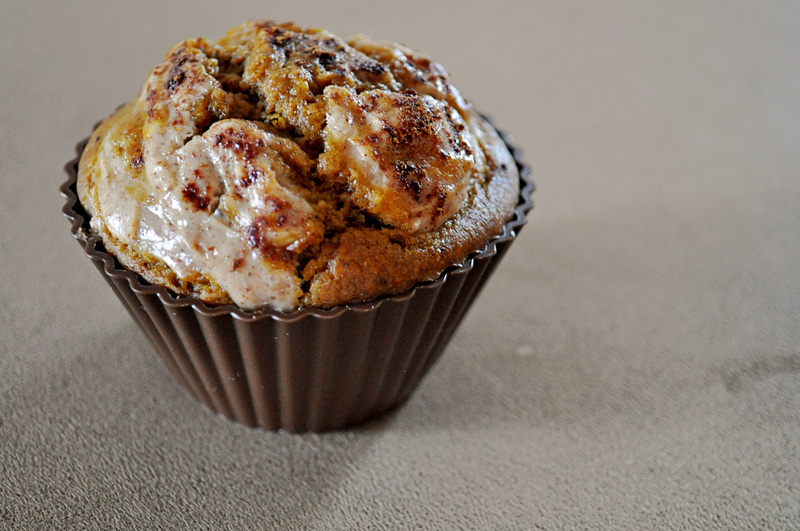 Lightly coat a 12-cup muffin tin or a mini muffin tin with cooking spray or line with paper cups. 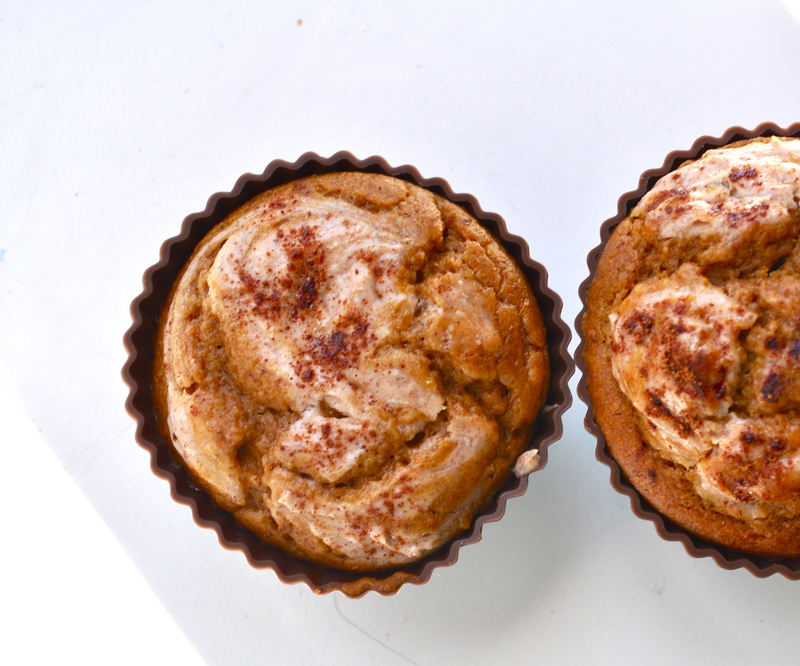 In a small bowl, stir together the cream cheese, powdered sugar, pie spice, cinnamon and agave until well mixed. You don’t want the mixture to be too thick, so add some milk if necessary. Set aside. In a medium bowl, whisk together flour, baking soda, salt and spices. 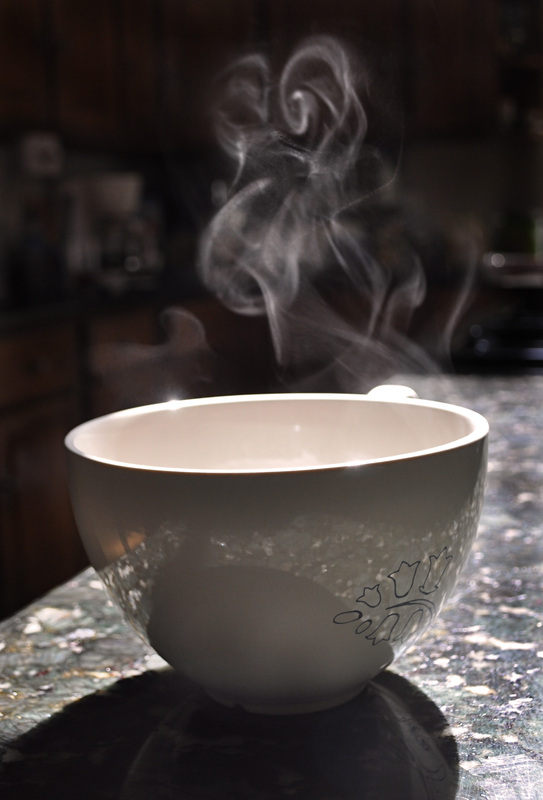 In a large bowl, whisk together sugar, maple/molasses, oil, and eggs until combined. Whisk in the pumpkin, vanilla, and buttermilk. Add dry ingredients into wet and stir just until fully moistened. Spoon batter into prepared muffin tin, filling each cup a little over 2/3 full. Spoon about 1 heaping tsp of the cream cheese mixture into the center of each cup. Swirl the two together gently with a skewer. 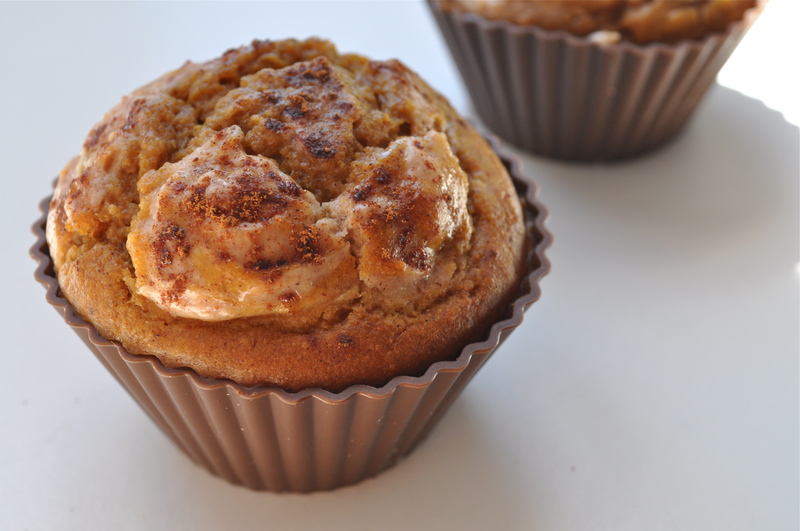 *Alternatively, you can fill cups halfway with batter, add a tsp of cream cheese, swirl, add more batter, another tsp of cream cheese, and swirl again for a layered muffin. Sprinkle tops with some cinnamon if you’re crazy in love with the spice like I am. 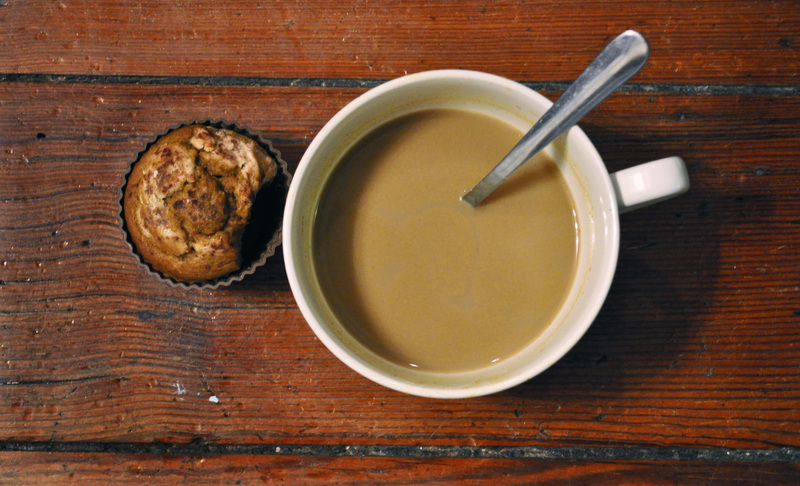 Bake muffins for 20-25 minutes or until a toothpick inserted into the center of a muffin comes out clean (the cream cheese may cling on to the toothpick, but the batter should not.) Let the muffins cool in the muffin tin for 5 minutes. Transfer muffins to a wire rack and let cool completely. Then I decided—why not have double the pumpkin fun and make a pumpkin spice latte?! Café y cacao: two incredible beans that are grown in the place I would most love to live—Central America. But I won’t get into that right now. We were at MOM’s Market, a place I’ve seldom been to but has a nice selection of organic and health foods. And seriously, I have never seen such an impressive collection of unique, gourmet chocolate! 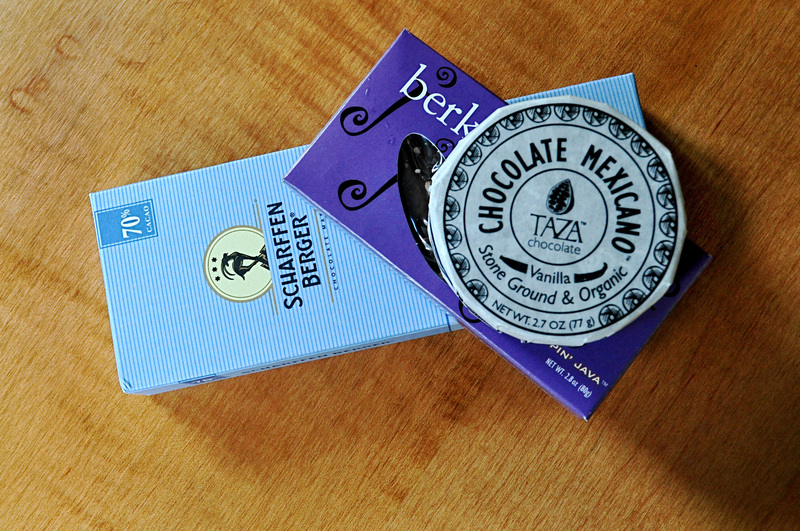 There were a number of chocolatiers I had never heard of (and I’ve tried a lot of chocolates), bars containing every kind of filling and add-in you can imagine, all percentages of cacao, and a good selection of locally-crafted bars. 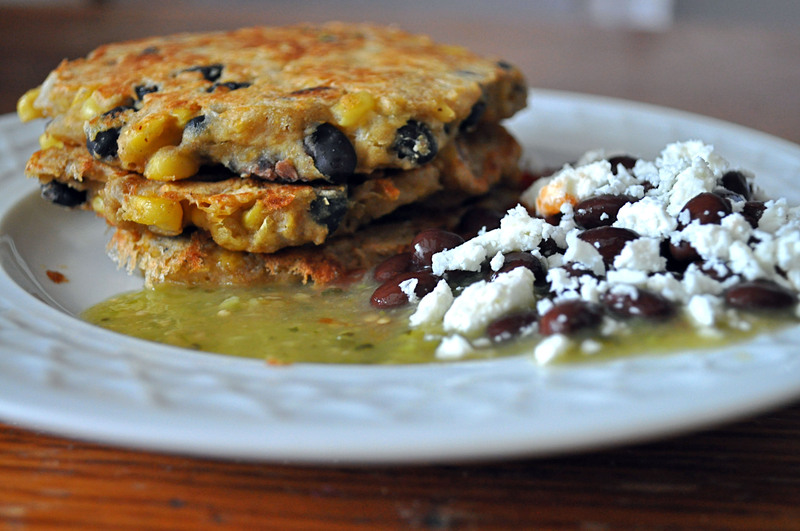 As you may know, I have a thing for Latin-inspired savory breakfasts. Especially with a black iced coffee in the summertime (which it SHOULDN’T still be on this first day of October!). Anyhow, I’ll keep taking advantage of the late summer veggies here while I secretly envy everyone up north sipping pumpkin lattes and wrapping up in cute scarves. 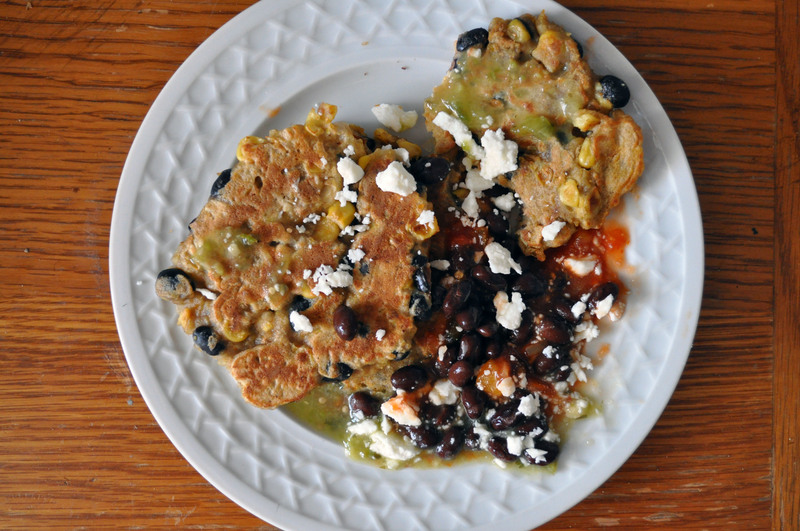 This recipe is for a savory kind of pancake, and what I love about pancakes is that you can throw in anything you like—fruits, veggies, spices—depending on your taste, or the season, or your mood… etc. Endless combinations = no boredom! 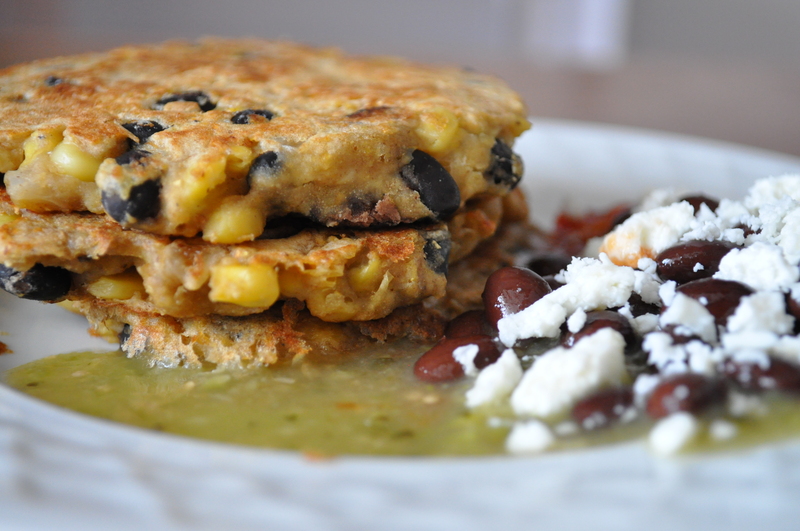 This recipe was originally for corn cakes, but I added in some chopped onions and black beans for more fiber, protein and a different texture. Maybe they’d be even better with a little sprinkle of chili powder? That’ll be for next time. Combine flour, cornmeal, baking powder + soda, salt and black pepper in a bowl. Pulse the corn a few times in a food processor or blender, until slightly pureed but still chunky. 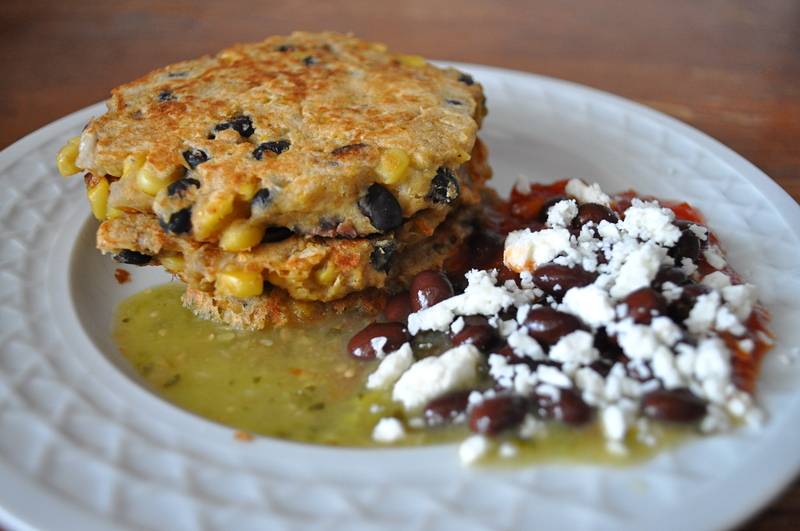 Mix the corn, onion and black beans into the flour mixture. Add egg, milk and agave nectar and stir until just combined. Add another tablespoon of milk if batter seems too dry. Preheat a splash of olive oil in a large skillet over medium heat. Drop the batter by heaping tablespoonfuls into the hot skillet and cook 1-2 minutes per side, or until golden brown. 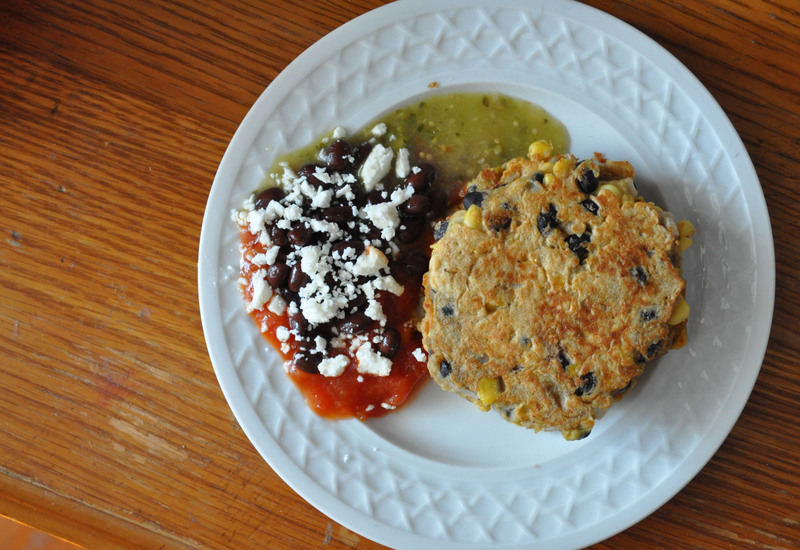 Transfer to a plate and serve with fresh cilantro, salsa and crumbly queso fresco or feta.